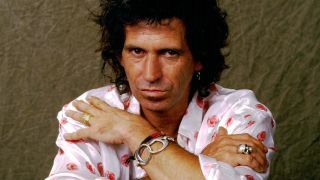 Keith Richards' debut solo album from 1988 is to be reissued later this year. The guitarist wrote and recorded Talk Is Cheap amid a feud between himself and his Rolling Stones bandmate Mick Jagger, with the record featuring the core group of Richards, Steve Jordan, Sarah Dash, Ivan Neville, Bobby Keys, Charley Drayton and Waddy Wachtel. They were joined on the album by a host of other guest musicians, including Bootsy Collins and Bernie Worrell. The remastered edition will launch on March 29 on CD, vinyl and on digital platforms, while a deluxe box set and a limited edition super deluxe box set will feature six previously unreleased tracks – including his cover of Willie Dixon's classic My Babe, which can be listened to below. While the CD and vinyl version of Talk Is Cheap are available via Amazon, the £467.99 limited edition Deluxe Box Set is only available through Richards’ website. Also contained in the package are a host of items, including 7-inch singles, an 80-page hardback book, lyric sheets, a guitar pick, two posters and more.